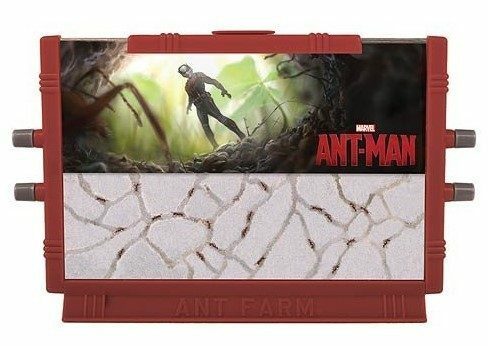 Uncle Milton Ant-Man Ant Farm Science Kit! You are here: Home / Great Deals / Amazon Deals / Uncle Milton Ant-Man Ant Farm Science Kit! Have you ever had an Ant Farm or bought one for your kids? I have to say I have never had one, bought one, or for that matter really ever seen one up close and personal. So, when they sent me an Uncle Milton’s Ant-Man Ant Farm to try out, I thought it would be fun for the youngest grandson, he’s 4. So, we put it all together and we had to order ants which would take a while, and that didn’t suit the 4 year old. So, “Papa” put out some “Ant bait” (a crumbled up muffin) and the next day we had ants! So, his mother (our DD) didn’t want to keep them at her house..so, here they sit on my desk for the grandson to “visit” when they come over. I wasn’t thrilled at first, but, I have to say looking at them from time to time during the day and watching them work and play makes me relax! So, I am actually enjoying keeping them here on my desk. If you’re interested in buying one for your kids (or yourself) this one is simple and easy to put together and takes up a small amount of space, too! Just in time for the new Marvel Ant-Man movie, Uncle Milton has put out this Ant-Man Ant Farm! Information to order harvester ants included. Learn multiple aspects of science with your favorite Marvel characters! Also, I have had them on my desk for about a week and there have been no escapes! It’s totally enclosed and safe – in Texas our ants bote – not sure about where you live, so I definitely didn’t want them escaping. The enclosure is shatterproof, too.